ClimaCare is a revolutionary new product which works to aid in the management of the skin’s microclimate. ClimaCare (patent pending) technology is available in the form of an inter liner which is used in conjunction with a standard cover to help maintain optimum skin temperature, reducing moisture and humidity build up, therefore helping to lower the risk of patients developing pressure sores and ulcers. ClimaCare features advanced Outlast® technology which proactively manages heat and moisture to give a better, more comfortable surface. Outlast® is a Space Certified technology which was originally developed for NASA, and was used to control temperature fluctuations of astronauts during space flight. 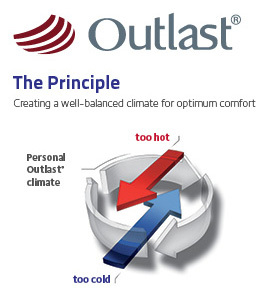 Outlast® technology utilizes phase change materials that absorb, store and release heat for optimal thermal comfort, and is tested and proven to alleviate spikes in skin temperature. Most mattress covers used in the healthcare industry at present are fluid resistant and easy to wipe clean, as well as being designed to help reduce cross-contamination. One major disadvantage of these surfaces is that they can contribute to the accumulation of heat and moisture between the surface of the mattress and the skin. ClimaCare actually works with a standard medical mattress cover to help reduce the build-up of heat and moisture, therefore helping to reduce the development of pressure sores and ulcers. Even a small rise in the temperature of the skin is recognised as a risk factor in the development of pressure sores, and is classed as a key factor in the skin’s ability to withstand prolonged stress. With a higher skin temperature, the metabolic rate must increase to keep up with the body’s demand for oxygen and energy. This can lead to increased tissue damage and ischemia compared to if the skin was at a normal temperature, even with lower levels and shorter durations of pressure on the body. Excessive moisture on the skin’s surface is also thought to reduce the resilience of the skin as well as increasing the level of friction, leaving the skin vulnerable to damage from pressure or shear stresses. ClimaCare works to actively regulate and maintain a normal skin temperature, reducing the levels of moisture and humidity, to ensure that patients receive the highest level of comfort and pressure care.